U.S. Air Force Brig. Gen. Mark R. August, 86th Airlift Wing commander (left), recognizes the Ramstein Airlifters of the Week on Ramstein Air Base, Jan. 17. U.S. Air Force Capt. Alex Johnson, 86th AW chaplain; U.S. Air Force Master Sgt. Norma Johnson, 86th AW readiness and training flight chief; and U.S. Air Force Staff Sgt. Jacob Johnson, 86th AW non-commissioned officer in charge of education and training, received commander’s coins for their actions in supporting Team Ramstein members’ spiritual resiliency. Three Airmen assigned to the 86th Airlift Wing Chapel received the honor of being Ramstein’s Airlifters of the Week, Jan. 17. The 86th AW Commander, Brig. Gen. Mark R. August, recognized Capt. Alex Johnson, 86th AW chaplain; Master Sgt. Norma Johnson, 86th AW readiness and training flight chief; and Staff Sgt. Jacob Johnson, 86th AW non-commissioned officer in charge of education and training, for their efforts in achieving the 86th AW’s mission. 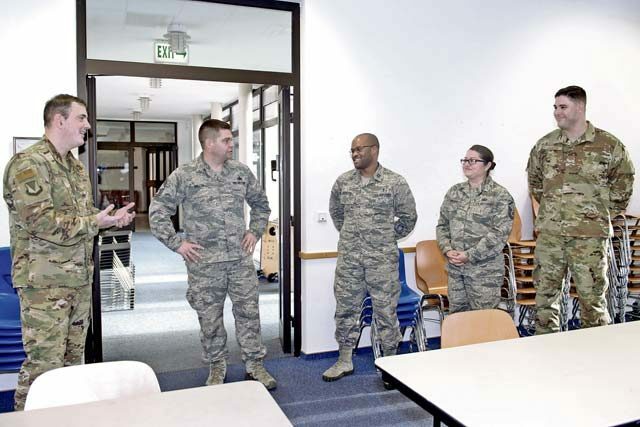 The 86th AW chapel team provides religious and counseling services to the more than 21,000 Team Ramstein members. All three Airmen expressed their thanks and credited their success to the entire chapel team as a whole. The Airlifter of the Week program recognizes Ramstein Airmen, who through hard work and dedication make the 86th AW the World’s Best Wing. U.S. Air Force Capt. 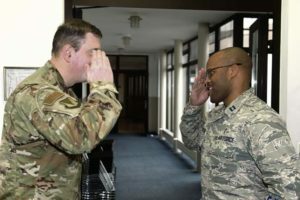 Alex Johnson, 86th Airlift Wing chaplain (right), salutes U.S. Air Force Brig. Gen. Mark R. August, 86th AW commander, after being coined by August on Ramstein Air Base, Jan. 17. 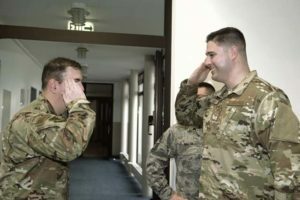 Johnson supports 14 units as their primary chaplain, while also preaching weekly at the Ramstein Chapel’s protestant service, and conducting counseling sessions. U.S. Air Force Master Sgt. Norma Johnson, 86th Airlift Wing readiness and training flight chief (right), salutes U.S. Air Force Brig. Gen. Mark R. August, 86th AW commander, after being coined by August on Ramstein Air Base, Jan. 17. Johnson supports base religious programs, spiritual care, crisis intervention counseling and advices leadership on religious matters affecting Airmen. U.S. Air Force Staff Sgt. Jacob Johnson, 86th Airlift Wing non-commissioned officer in charge of education and training (right), salutes U.S. Air Force Brig. Gen. Mark R. August, 86th AW commander, after being coined by August on Ramstein Air Base, Jan. 17. Johnson is responsible for helping ensure the freedom of religion for Airmen and their families through spiritual care and counseling leadership. 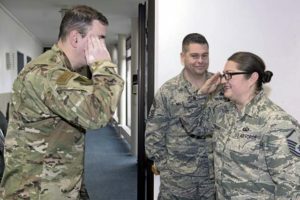 The 86th Airlift Wing command team surprised an 86th Maintenance Group Airman on Ramstein Air Base, Jan. 24.